Travel to Capri is a highlight of a Naples or Amalfi Coast vacation. Capri is an enchanting and picturesque island made of limestone rock. A favorite with Roman emperors, the rich and famous, artists, and writers, it's still one of the Mediterranean's must-see places. The island's top attraction is the famous Blue Grotto, Grotta Azzurra. Tourists arrive by boat at Marina Grande, the island's main harbor. Beaches are scattered around the island. 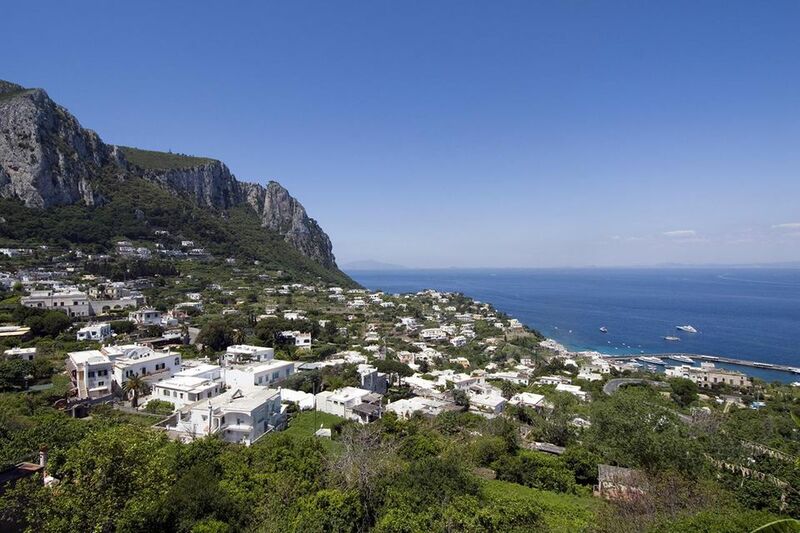 There are only two towns - Capri, just above Marina Grande, and Anacapri, the higher town. Lemon trees, flowers, and birds are abundant. The Mediterranean island is in the Bay of Naples, south of the city and near the tip of the Amalfi Peninsula, in Southern Italy - see Amalfi Coast Map for location. The island can be reached by frequent ferries and hydrofoils from the city of Naples and from Sorrento on the Amalfi Coast (see Amalfi Coast Day Trip to Capri). There are also less frequent ferries from Positano on the Amalfi Coast and the island of Ischia. Anacapri and Capri have a range of hotels. Anacapri may be more peaceful at night while Capri is the main center and has more nightlife. One of Capri's most chic hotels is the Grand Hotel Quisisana, an exclusive hotel since 1845 with a spa and baths. In Anacapri the luxurious Capri Palace Hotel and Spa is a member of the Leading Small Hotels of the World. The Blue Grotto, Grotta Azzurra, is the most fascinating of the island's many caves. Refraction of sunlight into the cave makes an iridescent blue light in the water. To enter the cave one takes a small rowboat from near the cave entrance. Once inside you're met with the spectacular sight of the blue water. See more about transportation to the Blue Grotto and visiting the Blue Grotto. Faraglioni, rock formations, are one of the island's natural wonders. The faraglioni make up the classic view one associates with Capri. On the shore, the Faraglioni beach is one of the island's most beautiful beaches. There are several other unusual rock formations in the sea around the island, including a natural arch. Anacapri, the highest town on the island, has splendid views of the harbor below. Near the central square there's a chair lift to Mount Solaro and a street lined with shops, several of which offer limoncello tasting. Olive trees, grapevines, and flowers give it a Mediterranean charm. Villa San Michele, in Anacapri, was built by the Swedish writer Axel Munthe in the late 19th century on the site of a Tiberian villa. Bits of the Roman villa are incorporated into the atrium and garden. Inside are traditional local and Swedish furnishings and hundreds of art pieces from antiquity to the 20th century. Not to be missed are the garden with breathtaking views of the cliffs, harbor, and sea. See more about visiting Villa San Michele. Capri is the main town of the island. Piazza Umberto I, often called La Piazzetta, is the central square that houses cafes and the cathedral of Santo Stefano. The piazza is filled with people both day and night. There's an archaeological museum in the town. Certosa of San Giacomo is a 14th century monastery near the town of Capri. It houses a museum and library and holds concerts. Nearby are the beautiful Giardini Augusto, gardens of Augustus. There's an overlook with great sea views from where the picturesque road, Via Krupp, winds down to the sea. Marina Piccola, the south harbor, has restaurants and a rocky beach with swimming. I had an excellent lunch on the terrace of Ciro' Restaurant with beautiful views of the sea and the Faraglioni rock formations. There are bathing establishments that rent sun beds or deck chairs for the day. The marina can be reached by bus or taxi. Roman villa remains from the 12 elaborate villas built by Emperor Tiberius include Villa Jovis, in a spectacular position on Mount Tiberio, the most elaborate and interesting and the Sea Palace and Baths of Tiberius near Marina Grande. The Phoenician Steps, 800 ancient steps connecting Anacapri to the sea, offer splendid views. Public buses run around the island, but they can be crowded. The funicular railway (funiculare) takes visitors up the hill from Marina Grande to the town of Capri. To get to Mount Solaro, the highest and most panoramic spot on the island, there's a chair lift from Anacapri during the day. Taxi service is reliable and the convertibles taxis are a nice way to travel on warm days. Boats at the harbor offer tours around the island or transport to the Blue Grotto. There are rental boats there, too. Tourist offices can be found in Marina Grande at Banchina del Porto, in Anacapri on via Giuseppe Orlandi, and the town of Capri's in Piazza Umberto I.
Capri is easily visited as a day trip from Naples or the Amalfi Coast but would probably be better enjoyed in the mornings and evenings when the hoards of day tourists aren't around. Summer sees about 10,000 tourists a day (about the same amount as the island's population). The island's moderate temperatures make it a year-round destination although spring and fall are the best times to visit. Limoncello, a lemon liquor, and items made with lemon are found in many shops and some shops offer limoncello tasting. Handmade sandals, ceramics, and perfume are specialties of the island, too. Via Camerelle is Capri's fashionable shopping street where you'll find exclusive fashion shops and luxury boutiques. Our Capri Picture Gallery has photos of Capri's top sights including the faraglioni rocks, Blue grotto entrance, harbors, beach, and the towns of Capri and Anacapri. It Started in Naples, a 1960 movie starring Sophia Loren and Clark Gable, takes place almost entirely on the island. The feast day of San Costanzo is celebrated May 14 with a procession at sea and in La Piazzetta, Capri's main square. On the sea there's a sailing regatta in May and a swimming marathon in July. During summer Anacapri holds classical music concerts and an International Folklore Festival in August. The year ends with the Capri film festival in December and a spectacular fireworks display in La Piazzetta on New Year's Eve.